I have been MIA from online and blogging a couple of days ago. Audrey was sick too on Friday, followed by me on Friday afternoon. But I'm glad that we had 2 days on the weekend to rest and to recover. Today we are back to normal again, ready to do our routines and activities. I continue to do my 2nd Christmas theme bento this morning. I made a boy with deer antler Christmas hat and red scarf. Deer antler Christmas hat were made from colored egg sheet and the red scarf were made from crab stick (only the red part). Inside the other box : steamed pork prawn balls and stir fried veggies with garlic (baby corns, broccoli, and carrots). Kids will start their final test for first semester next Monday so reviewing the lessons will start this week at the school and at home too. Audrey got the exemption to do writing task for her PE test. She is starting to research and collect some information as her PE teacher asked her to do. I wish everyone has a great start for this week and stay healthy! glad u are back :D cute bento! Aw, no fun to be sick but hopefully it means you will be well all winter. Glad to see your happy Christmas boy! No fun to be sick! Glad you're feeling better and back to sharing your cute bento! So adorable. I have antler ears too, but I won't look as cute as this guy! Welcome back Lia! Love the antler hat! Dang, this is what I dislike when I'm "away" from the blogging sphere - I missed lots of your super cool bento creations. You know what? I'm going to practice your Korean Saranghae expression to my bf *bet he's gonna love it hehehe*. And your Harry Potter bento? I'm totally in awe with you *don't be sick, but you are my egg sheet artist queen ;D*. Glad to know that you and Audrey are better... Can't wait to see another fantastic Xmas-themed bento from you! :D. Semangaaattt!!!! I'm glad to hear you're better. Have a great week! Glad that you are well now! Always looking forward for your bento and so glad that you are back! Love the cute boy! Love it! I can almost hear Santa's sleigh! @sherimiya : Glad to have a quick recovery. Had a lot of sleep during the weekend :D Thanks a lot Sheri! I hope you are all better now, I had a bit of a cold last week too. :( it's no fun! 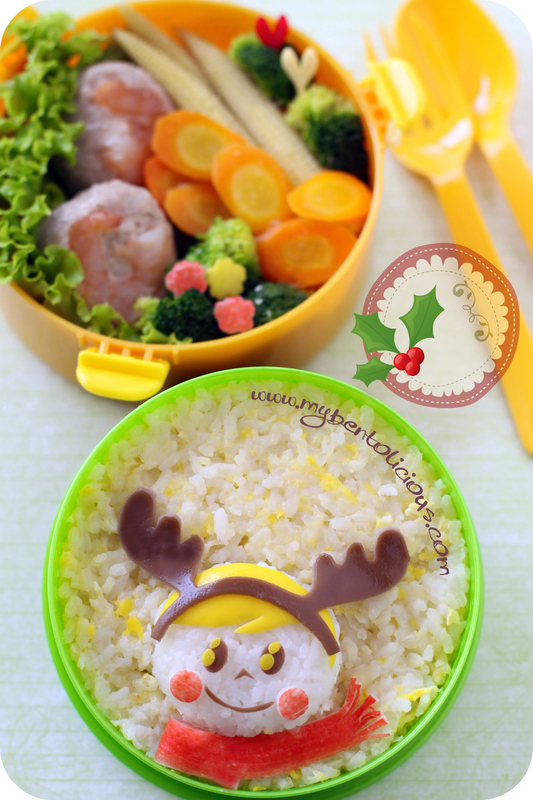 Your bento boy looks so excited waiting for Christmas to come!! He's so cute! So glad y'all are feeling better! So happy to know that you both are felling well now...hehe. Take good care o.
Lovely boy with the hat...so pretty. I love the scarf, look real...like blowing by the wind...hehe. Whew, glad you're feeling better now! Hard to be mom and be sick too. : ) This is super cute. I love the egg snowflakes.. Great attention to detail Lia! @Just a MOM : Always so sweet with your comment, thanks a lot Lin! Welcome back! Love bento, unique and happy delicate forms that you do so beautifully, Lia! Go for it, Audrey! I just feel lazy all the time.. might be the weather! Hope Audrey will do well the school tasks, sending strength! not sure if my earlier comment was saved but if not tks again for replying. think its not the photo edit but the additional 'stickers or add-ons' (can i call them that) that make the whole picture look too sweet. @javapot : Then you can try picnic.com then ... It's free and easy to use. Have fun!